It costs 80% less to retain a customer than acquire a new one. In most business scenarios, corporates achieve more revenue and growth from existing customers rather than new ones. Hence, it becomes all the more critical to identify customers at risk and take corrective measures to retain or let them go. 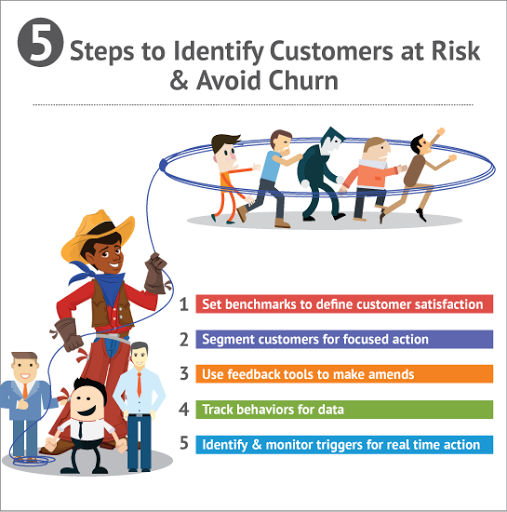 Here’s how you can go about avoiding customer churn. The aspirant group provides very good feedback and they really want to try your other products, but their economic background does not allow them to do so. There may be other reasons like contractual obligations, non decision makers or influencers, purchasing constraints etc. Once you identify the right reasons, you can work on strategies to remove those. This group is so enthusiastic about the product/brand that they follow instruction book to the letter. They utilize the product/service to create positive personal/business experience as well. You should concentrate on building greater engagement through exclusive previews, special discounts etc. This band is purely for short term economics. They may be in due to lack of competitors or options and are essentially hostage to your business. However, they present a big opportunity for you to develop into long term customers. This group has the highest levels of dissatisfaction and disloyalty. While most of them are genuine cases of service lapse, there are a minority who are really fickle with all brands. Review the case logs and determine which cases are genuine. Take their cases on priority, give redemption offers or gifts and show that you really care. For the others, develop an exit strategy that allows you to divert resources elsewhere. You will get a well structured feedback mechanism in a CRM solution. This will allow you to listen to customers and take corrective action. By asking the right questions, you can identify what the customer really thinks about your product/service. 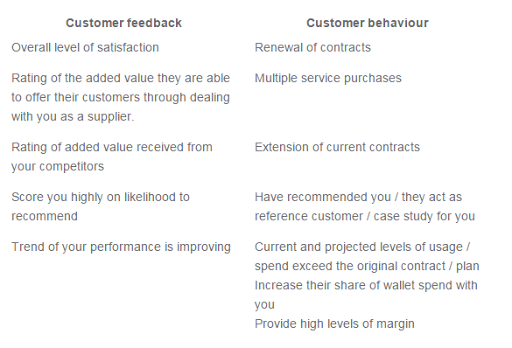 This will help you to proactively deal with issues and increase customer retention. Follow customer purchasing and subscription behavior to determine levels of risk. Has a customer dropped off the frequency of purchase? Tracking customer behavior will allow you to establish data points for trend analysis etc. They will also allow you to identify triggers that is the next step. There are certain established triggers that help you understand when the customer is on the verge of being at risk. Here’s a sample list of triggers to get you started. 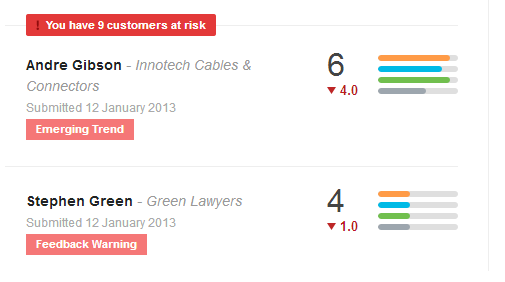 Next step: Call and follow-up with the customer to understand why he/she gave you such low ratings. Next step: These responses should raise a red flag. Follow up to know the problem areas and act on corrective steps. c. Customer declines meeting invitation. Next step: Though the causes may be genuine, it is a safe practice to proactively ask if there are areas of concern. Next step: Consistent complaints about a particular issue are a bad thing and you should never allow it to happen in the first place. However, if the customer goes silent, it probably means he has found a better alternative. To know the real scenario, contact the customer to update the steps undertaken to solve the issue. His response will give you a true picture. Next step: In most of the cases, it may happen that the customer is so satisfied that he doesn't care about giving feedback. But sometimes, he may be of the assumption that you are not suited for his requirements. It is best to directly contact the customer and ask if there is anything you can do for him. There may be circumstances that are beyond your control in retaining customers. But, with the help of the above five steps taken with CRM solutions, you can proactively identify at risk customers and take action to win them back.